You've got to give Donald Trump credit: he's everywhere, and everywhere he goes, he manages to offend in new and different ways. Take his quotes in the latest book by MSNBC Morning Joe co-host Mika Brzezinski, Knowing Your Value: Women, Money, and Getting What You're Worth. When asked about hiring working moms, the Donald replies skeptically, "She's not giving me 100%. She's giving me 84%, and 16% is going towards taking care of children." As a single working mother of two, I take exception to that attitude. But more on that later. The main topic of Brzezinski's book is the wage gap. Four decades after women entered the U.S. workforce en masse, a woman still makes 77¢ for every dollar earned by a man. Some of this gap is due to women's choosing lower-paying and more portable careers in order to support a spouse or allow for more time to care for children or elders. But about 40% of it can't be explained away. So when women choose the power track, what is holding them back? Brzezinski believes they simply don't know their own worth. Women, she says, don't take the time to research what male colleagues are making and demand the same; they expect, in a good-girl way, employers to be fair about pay; they worry that people won't like them if they negotiate too hard; they get too emotional or apologetic when asking for the money they deserve; and they don't jump as quickly as men do at new opportunities. We all know women of whom such things could be said, though I certainly know plenty who advocate for themselves as aggressively as any man. (In fact, the book is filled with them, from media maven Arianna Huffington to Yahoo! CEO Carol Bartz.) While Brzezinski makes some valid points, the wage gap is an economic issue that, like so many others today, is bifurcated. Age and education matter a lot. In some major urban areas, young college-educated women are actually ahead of their male peers in pay. "If you walk down the streets of Manhattan, London or Stockholm," says Boston Consulting Group (BCG) senior partner Michael Silverstein, "and you ask 100 single men and women between the ages of 25 and 30 what they make, the women will make more." He believes this is the beginning of a generational shift that will snowball as older women retire and younger women, who started out with equal education and more pay parity, rise through the ranks. Indeed, a number of economists believe that the average woman in the U.S. and Western Europe will outearn her male peers by 2024. That's because they are better educated and are entering the workforce in greater numbers and in the fastest-growing industries. 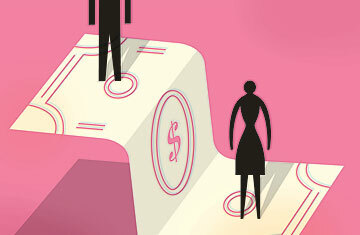 BCG estimates that women will earn the majority--some $5 trillion--of the world's new income over the next five years. No wonder banks like Goldman Sachs are starting to rate industries according to how much of the female dollar they are poised to capture. Merrill Lynch recently went "long on women" and companies targeting female consumers, noting that it expected women to "increasingly become the higher-income earners of U.S. households."